Wait a second, on the image it shows text that says 3K. If it is 3K resolution, they might be on to something very interesting. Last edited by MovieBuff; 02-21-2014 at 09:56 PM. Optical Resolution: Optical Format 1/3.2"
Dimensions (W x D x H): Camera: 3.07"x 1.27" x 1.50"
Base: 2.05"x 2.44" x 0.82"
If it does what they say it will do, I'm in when the price drops. My C910 just died, and Logitech doesn't have any to replace it. The C920 is not as good of a camera, in my experience. I'm surprised Logitech has not come up with anything at CES. Seems to be the cat's meow for Skype, so bring it! Yeah Al, I hear you on that. 'so many toys and so little time'. 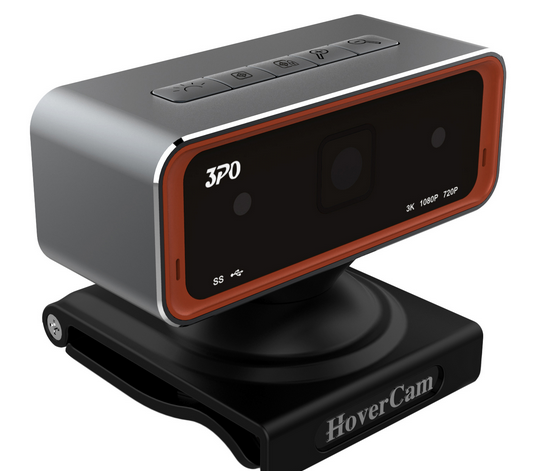 Wanted to give you an update on the HoverCam 3PO, the SuperSpeed USB 3.0 webcam. We've been showing it at some conferences including ISE - Integrated Systems Europe - in Amsterdam last week. Yes, it's 3K resolution. Yes, the image looks great. Yes, the image is fast. About the price, yes, it's not cheap, but, I can't find anything with this performance and quality for under $1,000, so for prosummers and business users the price is looking attractive. Alas, it's not a PTZ camera - at least not yet. You can do the P & T by hand. My guess is we will include our ASR an adaptive sensor response zoom that will allow the user to zoom with the mouse and do some limited panning when zoomed in. The zoom quality is much better than traditional "digital zoom." We're looking for release in the May time frame. Stay tuned and feel free to contact me with any questions - and for you die-hard enthusiasts who were on this chat initially who want one of these but for whom price is an issue - please contact me directly and I'll make you an offer you can't refuse. Very interesting device. Cool that you guys are on the site giving us info. I would love to see someone over at the IAIB review the product. would it be possible for you guys to send one over to them?